Reaping What They Sew In Helena, Montana : Participation Nation A sewing group makes soft necessities such as quilts and pillowcases to help abused women and children start new lives. Juanita Ryan (far left), Lori Westphal, Maureen Foster, Othelia Schulz, Karen Pagett, Delores Rosin, Kim Randall, Gladys Pearce. 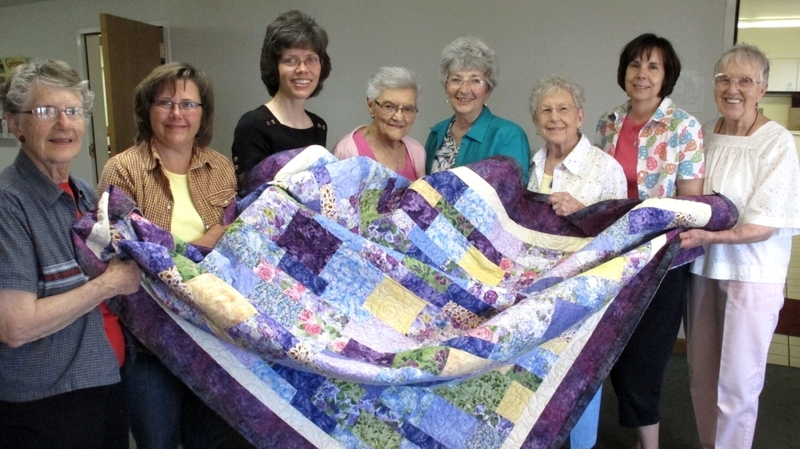 The sewing circle tries to help abused women and children start new lives. Every Thursday, about a dozen women gather at a church to sew and socialize. Working together, the group — started a decade ago by Juanita Ryan — makes quilts, pillowcases, placemats, dish towels and other soft necessities. The volunteers also pack up a few household items in hand-stitched bags and deliver them — along with the quilts — to The Friendship Center, a shelter for abused women and children. The sewing circle has a simple, substantive goal: To provide one bag and one quilt to each new woman who arrives at the center, to help her start her new life.